Mattie K. Frawley was born in Portland to Bill and Louise Frawley. A convert at age of five, she prepared for a year to be baptized with her mother and brother at Ascension Parish and then attended grade school there. Here she met Sister Roswitha Zenner, OSF, who was a great influence in her life. Her high school years were spent at St. Mary’s Academy. She had always hoped to be a teacher and entered the Holy Names Community. After receiving the name Sister Roswitha and making first vows, she continued her studies at Marylhurst College and graduated with a bachelor of arts. 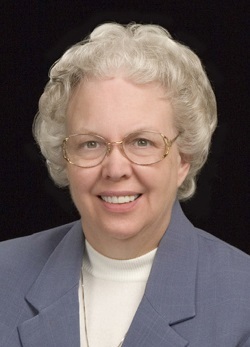 She taught middle grades at St. Frederic’s, St. Helens; Holy Redeemer, Portland; and Our Lady of the Lake, Lake Oswego. She was invited to be a presenter in Germany to teachers taking graduate classes. She had wonderful opportunities for graduate studies at Portland State, Marylhurst, and UCLA and completed a master of education at the University of Portland. She also served as principal at Our Lady of the Lake and Holy Redeemer Schools. Having been gifted with the opportunity to speak to teachers in graduate classes in Oregon and Washington, she was accepted as an adjunct professor at Lewis and Clark College, Portland, where she taught “Disrupting the Disruptor” courses. She started a consulting business working with faculty groups and individual teachers throughout the Northwest and presented at conferences in Anaheim, Cincinnati, Seattle, and Vancouver, B.C. She loved her teaching ministry. For the past 14 years, Roswitha has worked as Mission Director at Mary’s Woods at Marylhurst and has been part of the management team. Currently she serves on the Board of Trustees of Marylhurst University. Roswitha is filled with gratitude for her loving family, dear friends, fabulous students who taught her so much, and wonderful ministry partners. As a young woman she was under the impression that Sisters celebrating their Jubilees were old. Wisdom and life experiences have brought her to a different conclusion. She feels profoundly blessed by the Holy Names Sisters who have prayed, mentored, and encouraged her and rejoices in the wonderful opportunities to be of service.